On this page, you can find more information about the design of the ‘Delft Secret 23’. If you are more interested in it’s building project, please rush to here! Delft Secret 23 is the project name of our new to be built boat. After the IWR of 2017, Delft Waterbike Technology realised that MacBath is currently not a competing boat anymore, and thus a new boat had to be built before the IWR of 2018. With a group of enthousiastic students, most of them in favour of a monohull, we decided to start designing a new boat! Now, approximately half a year after that decision, we have the final design ready! The hull design is based on the Delft Systematic Deadrise Series. 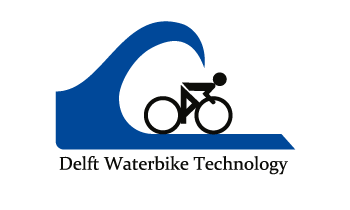 This serie has been developed in the towing tank of the Delft University of Technology and is because of its length-displacement ratio suitable for the design of our new waterbike. Remarkable is the placeing of maximum beam, in front of the nidship, which gives a lot of lift to lower the resistance. By the use of an generic model with all test data, our new hull is honestly ‘made in Delft’! With regard to the lay-out of the boat, there are not many differences between the former MacBath and DS23, simply because we are content about the central transmission system. This system might be the most important part of the boat; it is never allowed to break down. Furthermore, DWT wishes the new system to be a lot lighter and easier to maintain than MacBath’s system. By the use of bicycle parts, we were able to do so, leading to a thrustworty and ligth system. The hull is made of a carbon sandwich laminate of 5.6 mm thick. The inner and outer layer are 300g/m2 ±45°-carbon with a core of 5mm honeycomb structure in between. This results in a stiff and strong boat, which hardly has to be stenghtened anymore, while the bare hull only weigths several kilos. Interested in it’s weigth? Please make yourself known with the building page! The propulsor of the boat is a high aspect ratio pulling propeller, designed by the team itself. In the design process, accelaration behaviour was key, as the majority of disciplines are asking for a quick start. 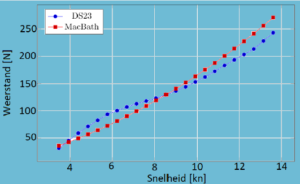 Using a strip model is Matlab, an ideal pitch and blade area distribution has been found, leading to an propeller significantly smaller and higher RPM than MacBath’s. And the coolest part is; one of our partners 3D-prints it from Stainless Steel! Propulsion of the Bollard Pull will happen by the means of an adapted Kaplan series propeller.